YPSA handover No Smoking Signage to Md Altab Hossain Chowdhury, ADC (general) of Feni District. He has declared the Feni District Commissioner Office and it’s premises as Smoke Free Zone. 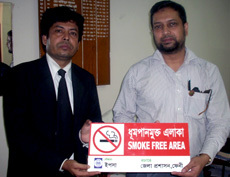 Mr Jahangir Alam Nantu from Smoke Free coalition of Feni and Mohammad Omar Shahed from YPSA handover the Signage.